UNITED NATIONS, March 12 -- For someone to remain a UN Under Secretary General, shouldn't the UN be able within 48 hours to explain what it is they do? On March 10 Inner City Press asked new / old UN spokesperson Stephane Dujarric about "Iqbal Riza, I still see listed as a high official. Can you describe what his current mandate, what he has been doing; what is he doing?" Dujarric replied, "As for Mr. Riza, I will double-check. I think I know what his current post is but I don’t want to speculate." Later all Dujarric did was insert into the transcript of the March 10 briefing this following: "[The Spokesman later said that Mr. Riza was a Special Adviser to the Secretary-General.]" But that doesn't explain at all what Riza has been doing, is doing, to remain an Under Secretary General. On on the morning of March 12, Inner City Press wrote to Dujarric asking for an answer before noon -- that is, before 48 hours elapsed since the simple question: "state not only the title (inserted into the transcript) but the current terms of reference, mandate of Mr. Iqbal Riza." Dujarric replied, "we are working on the briefing and will not be in a position to answer before noon." Three hours later, still no answer to the question asked fifty-one hours ago. And so consider: for an appearance in Lahore to moderate a Mahbub ul Haq lecture, Riza was listed as "former Special Advisor to the Secretary-General of the United Nations." But he's still listed as a USG. How long was he or has he been in Lahore, where he was listed for another event in February 2014? Dujarric and his office should have answered this, in fifty one hours and counting. There are other questions pending. 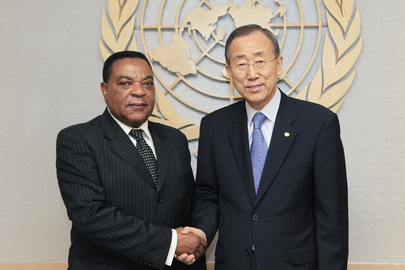 When Augustine Mahiga was replaced last June as the UN's envoy in Somalia by Nicholas Kay of the UK, little was said of where Mahiga would go next. Inner City Press on March 8 reported that Mahiga was given a little known Under Secretary General position, called "Under-Secretary-General, Mediator-in-Residence, DPA’s Mediator Debriefing and Lessons Learned Program." Inner City Press asked several well-placed UN officials who had, until asked, no idea that Mahiga had stayed with the UN, much less at the USG level. "Incredible," said one source who requested anonymity to keep his own UN position. On March 10 Inner City Press asked Ban Ki-moon's new spokesperson Stephane Dujarric (who previously spoke for Kofi Annan) about this quiet job-giving, to Mahiga and also Margaret Vogt formerly the UN envoy to Central African Republic. Inner City Press also asked what former Annan official Iqbal Riza is doing, still on the payroll under Ban Ki-moon. Later in the briefing Dujarric was handed a piece of paper ("Oil for Food," one long-time correspondent joked) and he read out on Mahiga and Vogt that the Department of Political Affairs sometimes keeps outgoing envoys on, for lessons learned. Are they paid, as Mahiga is listed, at the Under Secretary General rate? And in the case of Mahiga, for nine months and counting? And what about Iqbal Riza? The affable Mahiga was panned by Somalis inside the country and in the diaspora, for example during this Inner City Press reporting trip to Minneapolis in 2010. More recently, Mahiga was the (only) source for US Voice of America story about Somalia, here. But do departing UN envoys have a right to stay on in little known USG positions? As another source asked, Is Alan Doss still getting paid somewhere by the UN? This comes in a UN under Secretary General Ban Ki-moon which, even as it evades responsibility for cholera in Haiti, talks a lot of accountability and even transparency. How many other "secret" USGs are there? We'll have more on this. When UN Secretary General performed the annual ritual signing of the Compacts with his Under Secretaries General on February 13 amid the snow, three USGs were not present either in person or on video: Angela Kane, Joan Clos of HABITAT, and Jeffrey Feltman. Given the recently leaked audio of US official Victoria Nuland recounting how Feltman "got" Ban to sent Robert Serry to Ukraine, it seems worth asking with all due respect: where is he? Those present posed for a group photograph, tweeted here by Inner City Press, and then came up one by one to sign their Compacts and shake hands with Ban and his deputy, Jan Eliasson. For the first signer, former Egyptian Permanent Representative and now Special Adviser on Africa Maged Abdelaziz, Ban didn't stand up, so the handshake was repeated at the end. Ban, introduced by his chief of staff Susana Malcorra, made much of transparency, of making all this available through the press to the public. But a quick review of Ban's "financial disclosure" web site finds, for example, that Under Secretary General for Peacekeeping Operations Herve Ladsous has refused to make any public financial disclosure, stating that "in accordance with General Assembly Resolution A/RES/60/238, I have chosen to maintain the confidentiality of the information disclosed in my financial disclosure statement." Ladsous also refuses to answer Press questions, most recently on what the UN position is on Ugandan troops remaining in South Sudan, and before that about the mass rapes in Minova by the UN's partners in the Congolese Army. Video compilation here; UK coverage here. Ban's Children and Armed Conflict envoy Leila Zerrougui was there; by contrast, her Office made the inconvenient report that the Free Syrian Army recruits and uses child soldiers, and she has offered the Press an interview about it. Also there, on screen from Geneva, was Navi "Half Term" Pillay who had the honesty to report on January 20 that the French decision to first disarm the ex Seleka in Central African Republic put Muslim communities at risk. The UN should be open, and questions as with Feltman about a former diplomat's connection with his or her country cannot be off limits or considered "insinuation." Amazingly, though, when Ban did a question and answer session with 15 mostly Gulf and Western correspondents, afterward no tape or transcript was provided, despite a formal request from the new Free UN Coalition for Access, which is focused on opening up the UN to the press and public. And it was confirmed that none of the 15 even asked about Feltman, Ukraine and the Nuland leak. How not? Carman Lapointe of the Office of Oversight Services was there, even though the Secretariat says it can't speak for her of OIOIS, even refusing yet to say if OIOS is appealing the UN Dispute Tribunal decision which recounts that Michael Dudley of OIOS investigations acknowledged altering evidence after Inner City Press uncovered the distribution of Valium by UN Medical Service personnel with no New York State licensed. Is there immunity for that? Has the UN received and accepted process of the legal papers for bringing cholera to Haiti? This was asked at the February 13 noon briefing. It will be a litmus test for accountability, and for transparency. Watch this site.